When a local quarry yields up a garroted body with bad dental work and toes tattooed in Cyrillic, Joe Gunther figures it for a Russian mafia killing, rare as that might be in Vermont. But it's so very... tidy. So very... professional. Then the CIA calls, inviting Gunther down to Washington for some friendly "assistance" with his case. Suddenly he's caught up a shadowy game of cross and double-cross-manipulated by cynical cold warriors who seem not to have gotten the memo-and Gunther soon realizes that he's a pawn that both sides are willing to sacrifice. Archer Mayor is the author of the highly acclaimed Vermont-based series featuring detective Joe Gunther, which the Chicago Tribune describes as "the best police procedurals being written in America." He is a past winner of the New England Independent Booksellers Association Award for Best Fiction--the first time a writer of crime literature has been so honored. In 2011, Mayor's 22nd Joe Gunther novel, TAG MAN, earned a place on The New York Times bestseller list for hardback fiction. Before turning his hand to fiction, Mayor wrote history books, the most notable of which, Southern Timberman: The Legacy of William Buchanan, concerned the lumber and oil business in Louisiana from the 1870s to the 1970s. This book was published in 1988 and very well received; it was republished as a trade paperback in 2009. 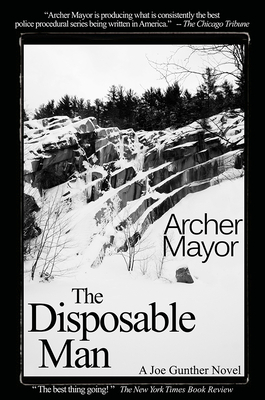 Archer Mayor is a death investigator for Vermont's Office of the Chief Medical Examiner, a detective for the Windham County Sheriff's Office, the publisher of his own backlist, a travel writer for AAA, and he travels the Northeast giving speeches and conducting workshops. He has 25 years of experience as a volunteer firefighter/EMT. Mayor was brought up in the US, Canada and France and had been employed as a scholarly editor, a researcher for TIME-LIFE Books, a political advance-man, a theater photographer, a newspaper writer/editor, a lab technician for Paris-Match Magazine in Paris, France, and a medical illustrator. In addition to writing novels and occasional articles, Mayor gives talks and workshops all around the country, including the Bread Loaf Young Writers conference in Middlebury, Vermont, and the Colby College seminar on forensic sciences in Waterville, Maine. Mayor's critically-acclaimed series of police novels feature Lt. Joe Gunther of the Brattleboro, Vermont, police department. The books, which have been appearing about once a year since 1988, have been published in five languages (if you count British), and routinely gather high praise from such sources as The New York Times, Washington Post, Los Angeles Times, New Yorker, and others, often appearing on their "ten best" yearly lists. Whereas many writers base their books only on interviews and scholarly research, Mayor's novels are based on actual experience in the field. The result adds a depth, detail and veracity to his characters and their tribulations that has led The New York Times to call him "the boss man on procedures."